Stacia J. 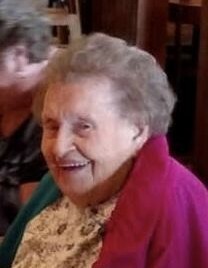 (Julia) Gulash, of Bradenton, passed away on February 9, 2019, surrounded by her loved ones. Born in Haydenville, MA, she was preceded in death by her parents Stanislaus (Stanley) and Mary (Ozalek) Golash, soulmate of 35 years, Joseph A. Gulash, Sr., of Bradenton, and grandson Ricky Woodruff of AR. She is survived by five daughters, Mary (George) Taylor of Palmetto, Judy (Earl-deceased) Woodruff of Columbus, OH, Frances Gulash of Orlando, Tricia Shinkle of Bradenton, and Barbara Gulash of Orlando; three sons, Joseph (Joe) Gulash, Jr., Richard Gulash, Sr., and Edward Gulash, all of Bradenton. She leaves behind eleven grandchildren: Nanette Taylor of Bradenton, George Taylor, III, of Timberlake, NC, Joseph Gulash, III, of St. Petersburg, Angela (Brian) Petrie of Atlanta, GA, Joe (Jeni) and Nicholas Woodruff of Columbus, OH, Richard (Telena) Gulash, Jr., of Seabrook, TX, Stephen Gulash of Parrish, Brian (Susan) Gulash of Tampa, Jeremy (Brooke) Gulash of Bradenton, and Stacie Shinkle of Bradenton, in addition to 23 great-grandchildren: Ryan and Brandon Fergerson, Ambriel Hamilton, Journey Youmans, Julie Taylor, Eli and Malakai Petrie, Joseph Tanner (JT) and Jacob Woodruff, Connor, Camryn, Austin, and Zack Gulash, Aydin and Andrew Frazier, Ella Spina, Madison and Makayla Gulash,Talyn Gulash, Nevada, Gracie, and Joanne Woodruff, and Michael Woodruff. She retired from the Manatee County School Board Transportation Department assisting handicap students during transport to and from school. Services will be held at Shannon Funeral Home Town Chapel from 11:00 a.m. - 12:30 p.m., with a Funeral Mass to commence at 12:30 p.m. on February 16, 2019. In lieu of flowers, donations can be made to the American Cancer Society or Tidewell Hospice Home, Bradenton.